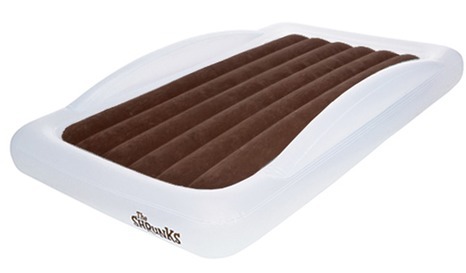 The Shrunks Inflatable Toddler Travel Bed makes life easier! I love taking vacations! Whether it is spending a few nights at Grandma’s house or off at a family reunion it is always nice to “get away from it all”. Unfortunately, I have one giant problem when it comes to travelling, my 2 year old is attached to her toddler bed. We certainly can’t take it everywhere with us and she is too big for the pack n play. It seems the only way to get her to go to bed at night when we are away from home is to put her in bed with my hubby and I-this consigns us to a pretty restless night, as she rolls EVERY where, all night long! After she falls asleep we sometimes will move her to the floor near our bed, but with no “bed” to restrict her she rolls into the walls, suitcases, and even once I found her under the bed! I knew that there had to be something on the market for the toddlers that had out grown the pack n play but were too young for just a blanket on the floor. That is when I found The Shrunks-Toddler Travel Bed, an easy, convenient, inflatable bed for toddlers! This toddler travel bed arrived mid day and the very first thing I noticed was that it was carefully packaged. I LOVE when I can see a company cares enough about it’s products to package it well so the customer can have a great first impression! It also tells me that I have received a quality product worth protecting. Once I took the actual bed out of the box I saw that it came with a nice carrying bag for convenient traveling! 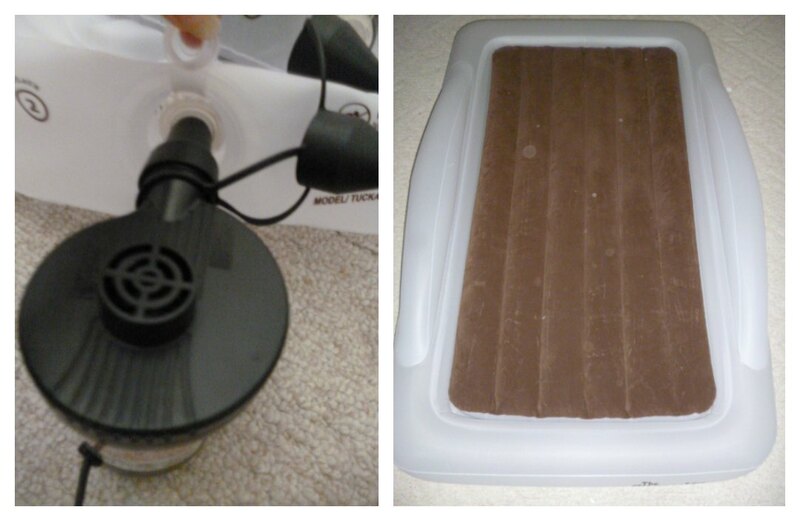 It also came with an electric pump. 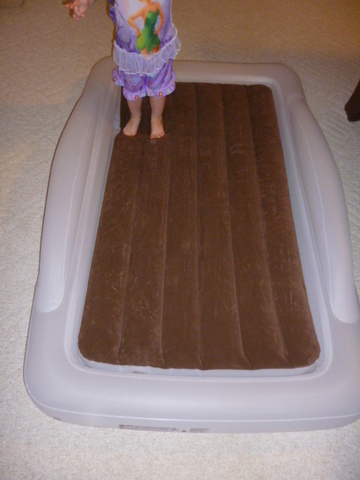 I had not planned on using this air bed until we went on a trip, but then my 2 year old came down with a high fever. I wanted her near me and realized this travel toddler bed works for more than just traveling, it works great for when you have sick kiddos, sleep overs, when a child has a bad dream, etc! I have a feeling we will be using this bed a lot! The pump was super easy to use. Just plug it in and switch the button to on. This pump had 3 different sized attachments that came with it! They were all connected on a strand that was connected to the pump. I love that I will never have to worry about losing the attachments! They were 3 different sizes so I can use this pump for more than just my Shrunks Inflatable Toddler Travel Bed, I can use it for many things! The bed came with instructions but the bed was clearly marked on which part to fill first. 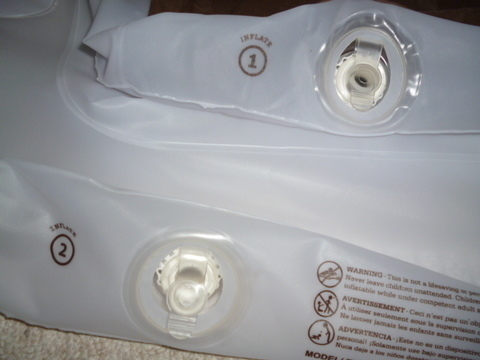 The Shrunks inflatable toddler bed had an awesome plug feature to make inflation easy! 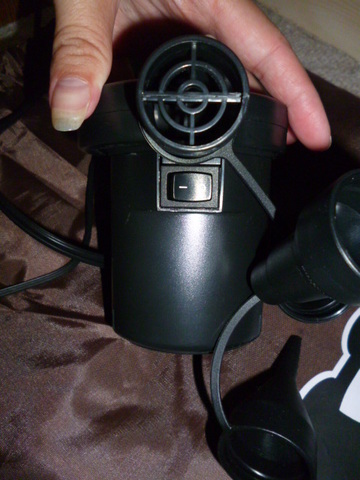 All you have to do is pull the rubber stopper up and it will allow air to get in, but not allow any to get out. This made filling the bed a breeze! 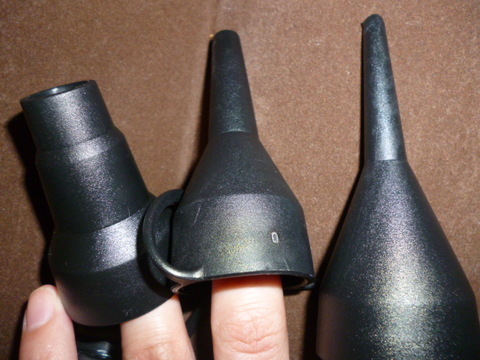 I plugged in my pump, attached the largest attachment, inserted the pump into the bed and turned on my pump. The mattress part of my Shrunks indoor inflatable toddler bed was blown up in 6 seconds! WOW! I was SUPER impressed! 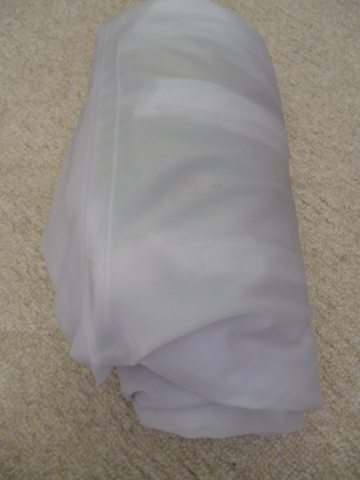 I then found the 2nd opening to fill the bottom base of the toddler air bed. This was bigger than the mattress so I expected it to take much longer. To my great surprise it only took 10 seconds to fill the entire base with air! Even my husband was impressed! My 2 year was instantly in love with this just-her-size bed that appeared in less than 20 seconds. She kept saying, “How did you do that, I love this bed!” The mattress part is covered with a brown suede like material that is soft and your child certainly can lay on it without a sheet. The mattress is attached to the base of the bed, but the edges lift up so you can cover the mattress part with toddler/crib fitted bed sheet if you want to. You can also tuck your child’s blanket around the entire edge so they stay covered all night! My 2 year old was very excited to go to sleep in her new bed and I didn’t even have to ask her to lay down. Within minutes she was OUT like a light! I took comfort in knowing that I was close to her if she needed me, but LOVED the fact that I was going to be getting some restful sleep. We have had this toddler travel bed up for 4 nights in a row and it has not lost one bit of air! I am impressed with how well it is made! My 2 year old (who last month gave up her afternoon naps-SAD day for me!) has voluntarily taken a nap every day for the last 4 days in a row sleeping on her Shrunks Toddler Travel Bed! Which makes me LOVE this bed even more! Deflation was just as easy as inflation and took less than one minute to accomplish. I just pushed the black rubber stopper back and the air came gushing out! My bigger girls enjoyed helping me roll it up. This bed is can hold up to 150 lbs…which means even I can use it if needs be, although my feet would hang off quite a bit. I have been really impressed with this bed! 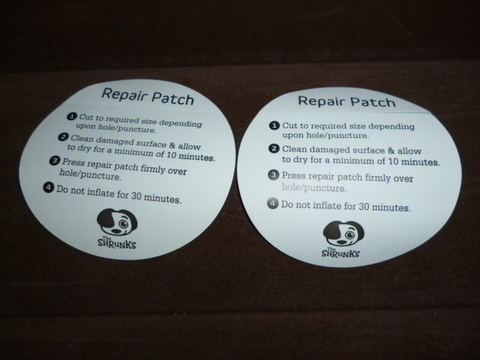 It also came with 2 repair patches! Just click here to vote for them to make it into the top 10! You can purchase The Shrunks Toddler Travel Bed for $79.00 on their site. It is giveaway time! The Shrunks has offered to give one of my readers a toddler travel bed of their own (valued at $79!) All you need to do is fill out the Rafflecopter form below. This giveaway is open to US residents only and will end at 11:59 pm EST on 7/27. You only need to do one entry on the Rafflecopter form to get your name into the drawing….the rest are optional! GOOD LUCK! Congrats Angela, you have been emailed and have 24 hours to reply! Disclosure: Cj from I Love My Kids blog receives free products for review purposes, and may sometimes be compensated for posts. All opinions expressed are solely from Cj. My opinions are my own and were not influenced by any form of compensation. This event is in no way administered, sponsored, or endorsed by, or associated with, Facebook and/or Twitter, Google, Pinterest. This disclosure is done in accordance with the Federal Trade Commission 10 CFR, Part 255 Guides Concerning the Use of Endorsements and Testimonials in Advertising. The Outdoor Tuckaire Toddler Travel Bed looks awesome too. All their beds look cool. Bandit Mini Travel Luggage – Orange is adorable! perfect for trips to grandma! This looks awesome! It would be great for traveling and visiting grandma! I would love to win this!! It would come in very handy!! Wow what a cool travel bed. This would be great for our kids when they are sick to be close to Mom n Dad or for traveling.. The inflatable bed rail is a great idea for camping!!! Another item that would be useful for my family is the Bandit Mini Travel Luggage. We take short trips here & there & it would come in handy! Would love the bed rail my son falls out of bed probably once a week and it would be such a big help! We would be able to use the stepaire bandit nap mat in red for sure. That inflatable toddler bed looks Amazing!! My 2 year old would LOVE it and would be so convenient for overnights because I have a picky sleeper! The luggage is so cute and would work great for the family. I like the sunny plush pillow. I would LOVE this! Would come in very handy on our next trip!! I think the inflatble bed rails are an awesome idea as well! everything is cute all the in house sleeping bags but the mini luggage is different too.! I love the Sunny Plush Pillow and the Toddler sleeping bag. I love the Bandit Mini Travel Luggage! this would be great for when the grandkids visit! The Bandit Mini Travel Luggage looks nice as well. Thanks! Stepaire Bandit Nap Pad Orange – perfect for our cabin! Thanks for the great info on this product it’s the first time me seeing such s great item and thanks for the awesome review I really want this for my daughter it’s perfectly sized and would fit perfect side by side with my queen air bed in my moms tiny apartment. Thanks I will be looking into purchasing this so cool. Thanks for the chance to win. I could use this for my boys. Would be great to have one, and its a great idea!! The outdoor bed and the kids bed are both interesting to me. I love this bed, so cool. hope I win!! The outdoor toddler & kid bed would be great for camping in a tent (more comfortable too)! Tuckaire portable kids bed would be fabulous! The kids travel bed and the toddler travel bed would be useful to my family! This is so cool would be great for our many sleepovers! Stephanie Bandit Snap Bed in Red! Love the Pink Bandit Mini Travel Luggage! Love the toddler bed. When I went to visit my son who is in the Army I would get to sleep on an air mattress. Now his daughter could have her own bed at our house. P.S. It was a really comfy bed and I was just glad to get to stay with him. I like the Sunny Wheeled Travel Bag. The luggage is really cute. The inflatable rails would be great though! I think the luggage would be very useful! Since I have 5 grandchildren and love to camp, the Outdoor Tuckaire Kids Travel Bed would be perfect to take along for the grandbabies! This would be great for the grandchildren to use! This would be amazing for my 16mo old, when we go away. We could definitely use the Wally Inflatable Bed Rail. The mini travel luggage in pink 😀 adorable! I love the sunny wheeled travel bag. It’s so cute and I know my boys would love carting it around. Bones pillow or this travel bed! Starting over in my sixties with a toddler Grandson, I need ALL THE HELP I CAN GET!! Lugging all the accessories around is not the same as when I was a young Chic!! Blue Bones Blanket would be great too! I would love to have the toddler travel bed. With 2 kids and another on the way it would really come in hand when we travel places! This is perfect for what I need!! Indoor Tuckaire toddler sleep bed would be great! This would be great for nap time and sleepovers. Yes this is perfect for my grandchildren to use ! Easy an compact an seconds to use an deflate ! I would get the Stepaire Bandit Nap Pad Orange. It looks PERFECT for a daycare nap mat! Bandit Mini Travel Luggage – Pink is adorable. Great review and product. Thx for the chance to win! this would be great as we take our 2 year old granddaughter camping plus i would feel better if she had a bed with sides when she stays at our house! great idea! I really like the Wheeled-Travel-Bag and weirdly the foot bellows. i think the nephews and nieces would get a kick out of using it rather than watching the electric pump….but “cough”most likely we would get the electric pump lol. This would be great for sleep overs. I would love this for my granddaughter. We wouldn’t have to worry about putting her to bed while the rest of us catch up on things. I would hands down love tha bed! EEspecially since I am currently in the midst of vacation with two kids under four. The travel luggage is really cute.My grandkids would love it. I also like the Stepaire Bandit Nap Pad Red. I would like the sunny travel bag for my grandkids!! I like the mini travel luggage. Very awesome. The bed is so nice and would love it for our grand daughter to sleep on with trips. I like the luggage and think the beds are very cute! I like the bandit nap pads also. They are really neat. Would love this for my grand babies.. The pillow would be neat for my youngest granddaughter. connie d.
I think the inflatable bed rails are a great idea–I’m all about safety! Outdoor Tuckaire Kids Travel Bed. 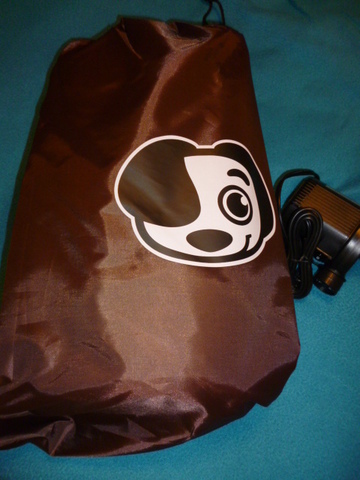 I also saw a “Shrunks” Tent in a picture but I don’t see it for sale but that would be another awesome item if I could find where to buy it and the price and stuff for it. I love the toddler sleeping bag. My daughter will scoot down in the big sleeping bags while she is sleeping and that would be the perfect size for her. The nap pads would be great to have for my grandkids. Inflatable bed rail looks helpful! I have a 3 year old son and I watch my 4 year old Granddaughter all week. It would definitely be helpful to have one of these for my Granddaughter at naptime. I would love the pink bandit luggage. Stepair Bandit Nap pad orange.. cute and functional! This is just the neatest Idea great for my grand kids! My kids would LOVE the Sunny Wheeled Travel Bag! And I would love for them to keep track of their own luggage … which they’d be much more likely to do with a cute bag like this! My family could use the Jetaire electric pump! I love the pink bones blanket. This is sooo cool! I’ve never seen such a thing. Would be great for the grand daughter! I would love to win this!~ This would be so great for when my grand daughter comes over to visit. I could take this anywhere for her! outdoor travel bed would be awesome! Sunny Wheeled Travel Bag would be perfect. were traveling in September this would be AWESOME! I would love to be able to win this to use for my grand daughter when she comes to visit! We could travel with this everywhere! I have my fingers crossed for sure! The pink suitcase is neat! Might come in handy! 1st grandbaby on the way soon! Love the bones blue blanket… We just bought a camper and this would be great!!! I like the little toddler sleeping bag. Bandit mini travel luggage or the bones pillow. both look great! I like the Blue Bones Blanket. The sunny travel bag! Love the bed would be perfect when my granddaughter comes to stay!! This would be perfect for our yearly family camping trip. Love the mini suitcases. They are so adorable! It’d be so cute to have something my daughter could call hers.. plus LOVE the bed. Super convenient looking and looks comfortable. Looks like a neat bed for kids. My grandbaby will be able to use it sooner or later. I love the idea of the Wally inflatable bed rail. Great way for kids to adjust to a “big kid” bed. I think the little suitcases are adorable, and so are the bones pillow and blankie!! The Sunny Wheeled Travel Bag would be great! Just got on here and saw this….would love to have. 4 year old grandson would have a blast sleeping on it. Love the Bandit luggage also. I love the Outdoor Tuckaire Kids Travel Bed! I wold love any I the toddler beds as we have a 2 year old grandson, whom we need something for him to sleep in at our house. Traveling soon with my granddaughter-this would be perfect! I travel with my 4 year old a lot and she would love the pink mini luggage! I think this is the perfect thing for those sleep overs at Grandma’s house. Soon my twin grandchildren will be old enough to be out of the pac n plays and need some other place to sleep. Sure hope that I win this. I like the travel bag. My kids would love to have this. The bandit multiplay mat would be great for vacations! I like the Bones Blanket Blue, the Sunny Plush Pillow and the Bones Vinyl Repair Kit. I LOVE this bed! I like the Outdoor Toddler Bed also. The Jetaire electric pump would be great to have to fill up all the different things the kids have that need pumped up with air. Especially in the summer! Our grandchildren would love this! I also like the outdoor ones with the sleeping bag. Totally Awesome Toddler Bed !! I like the Bones Bed Protector to go with the bed. Love the kids airbed. Would be great to have for trips!! This would be great to have on hand when my granddaughters are over ,it would mean I didn’t get pushed out of my bed any more. This is super cute and would work wonder’s at my house when my grand daughter comes for a visit! i love the nap pads! I was just scrolling facebook and saw this and thought how cool. It looks comfy too! The toddler sleeping bag is great, so cute too. This could be awesome. I have 5 great grand children. would be so happy to win this for my kids! I think the inflatable bed rail and the outdoor bed would come in handy on vacations. The bed rail for hotels and the outdoor bed for camping. What great ideas! The Bandit Family Blanket would be great for us to take to the park, tball games and the beach! The Sunny Wheeled Travel Bag would definitely come in handy for us. This is brilliant!! I need this for NaNa’s house!! I love the Stepaire Bandit Nap Pad Orange. I really love the one that you reviewed, it’s AWESOME!! Thank you for the chance! I’d also like one of their family blankets. I love bed I want one so bad now! The outdoor kids bed looks great! I could easily use that for anyone in my family to, sit, read, sunbathe! The bandit nap pad would be great for my 4 yr old daughter! 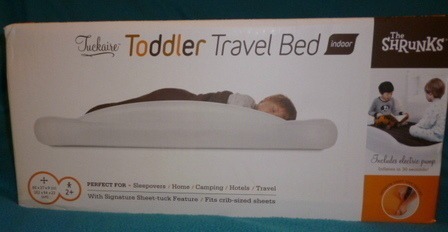 I’m hoping to win the travel toddler bed for my 2 yr old, though! This is awesome. Thanks for the review! the Mini Travel Luggage is so cute! That could come in handy ! I am interested in the Outdoor Toddler Camping Bed. Was recently going to stay by a lake but am now staying in a hotel near the lake and driving to the lake because we don’t have one of these. The Indoor Toddler Sleeping Bag would come in handy for us. The Outdoor Tuckaire Kids Travel bed would be great for our camping adventures. OMG this bed would be perfect at grandma’s house and the outdoor one would be fantastic for camping. Whatever one I had, I would need to buy another bc the “small one” always wants what big bro has…. The Stepaire Bandit Nap Pad would be helpful for us! I like the Bones Fitted Sheet in pink. My husband and I have our nieces and nephews come to visit from time to time, and this inflatable toddler bed would work well for them! Thanks for the chance. the bones fitted sheet in pink would be great. I would love to have it to cover the liner. in addition, pink is the girly girl. The bellows foot pump would be great for camping or power outages! love the idea….have been wanting one of there for some time now! this would be so perfect for my niece. she is spending the summer with us from NY. The mini travel luggage in pink would be perfect for traveling. I like the Indoor Tuckaire Toddler Sleeping Bag. I would love the mini-travel-luggage-pink. My daughters would love this as well. With this travel bed and the wheeled travel bag – my little girl wouldn’t have to sleep with mum on all our travels. Thanks for the chance to win this. It would be great to have when my niece or nephews come to visit. I also like the bed protector. Especially since young children would be sleeping on it. The sunny wheeled travel bag would be great too! All of their items look awesome! I love the Outdoor Truckaire camping bed! My family loves to camp, yes in a tent! and this would be so awesome then just on the ground with triple blankets from the ground up to their sleeping bag! I would love to get 2 of these! We camp all the time and just about everywhere! I think their outdoor Tuckaire toddler bed would be fabulous! The Bandit Mini Travel Luggage – Blue would be awesome! I so need this. WoW! Love this!!! Need it so very much!!! Would make bed time at grand ma;s so much easier!!! The outdoor toddler bed would be great for camping. I think the Bandit Mini Travel Luggage in Orange is absolutely perfect!!! It could be used for boy or girl, and with the sleepovers between grandparents and cousins, it would hold all their ‘treasures’. I like the Wally Inflatable Bed Rail too! I like the nap pads also! I love this bed! I have one, and we popped the rails :(. I cant get the repair patches to hold, so I NEED a new one!!!! This would be great for my kids and their friends to use! I love the red nap pad! i think the inflatable bed for bigger kids and the bed rail would also be very helpful around our house. we have that same issue when traveling too and this bed would be a big help! The travel luggage would be nice. We would love the Sunny wheeled travel bag on their site! The outdoor toddler bed would be awesome! I like the luggage…so cute for them! Would absolutely love to win this!!! I love the out door travel Bed! I think the orange nap pad would be helpful for my family. Indoor Tuckaire Kids Travel Bed is what we would like. Would love to own the Outdoor Tuckaire Toddler Travel Bed. I would like to get the Bandit Mini Travel Luggage – Pink for my granddaughter. Very handy for trips to grandma’s. I like the Bandit Mini Travel Luggage – Pink for my daughter. I think my daughter would love the Bandit Mini Travel Luggage in pink. The SUNNY wheeled travel bag would be real handy! This is brilliant!!! My nephew is rapidly out-growing his pack and play and this would be ideal for nap time!! Thank you! I like the Sunny Plush pillow! The Sunny Wheeled travel bag is awesome! The Sunny Wheeled bag is very nice, as well as the outdoor bed, also.